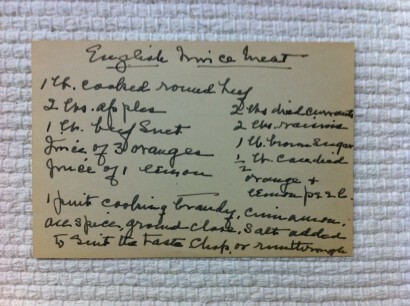 My maternal grandmother was a fantastic cook. Yes, I know everyone says that about their grandmother, but she really was a master at classic cooking and actually earned her living for a time cooking for well-to-do families in Connecticut’s quiet corner. In her later years which are my memories with her, she cooked without recipes or cookbooks. On Sundays after church services in our suburban town, our whole family would pile into the wood paneled, station wagon for dinner with Nana in the city. She lived in a brownstone in Boston’s South End on a square with a wrought iron fence surround and a beautiful fountain, just down the street from Boston City Hospital. In order to offset the expenses of running a large home she rented rooms to residents working at the hospital. Now this made a visit to Nana very interesting as it offered hours of active entertainment running up and down the four flights of stairs repeatedly introducing ourselves to her boarders. They were so tolerant of our knocks on the door and random chatter until we were called to come to the table. Her house was grand in late 1800’s style with enormous solid wood doors with mercury glass door knobs, handsome carved balusters, marble hearths and mantels, high ceilings and great antique furniture. Although the floor in the kitchen had a decided slant to it, the overall effect was understated luxury. I loved visiting. I didn’t love staying overnight as my sister did. I worried about the sounds of the city and usually asked if I could go home in the middle of the night. My Nana would comply and call my Dad to come get me. Nana always served Sunday dinner on her good dinnerware with sterling flatware and to this day I think of her when I touch piece of sterling. She had good taste and it helped me learn to appreciate style. She reupholstered in great floral prints, did needlepoint bench covers in lovely soft English rose patterns, painted, wallpapered and could knit like the wind. Many of the sweaters that she knit for herself, my mother or me, I still have and wear on occasion- although not too frequently as I don’t want to wear them out. After fifty something years, I think I am not likely to do so, but just to be cautious, I save the fuchsia wool, cabled cardigan with hand knotted buttons and bracelet length sleeves for only a few days a year of wear. After Nana moved out of the city I had dreams of buying her house and renovating it. I still go by it and imagine how I would have restored it. Maybe someday I will, but that too is a bit of a dream. Several years ago, my mother gave me Nana’s cookbooks, both of them. 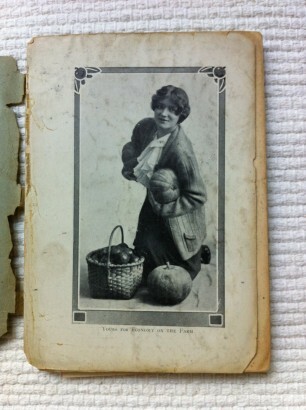 They are lovely having developed the patina of a well used, yet cared for book. 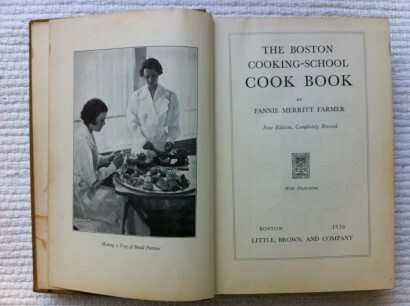 I have referred to many of the recipes in her 1936 edition of The Boston Cooking-School Cookbook by Fanny Merritt Farmer when I need a solid, basic technique recipe of less than three, short paragraphs. If it goes into too many steps, I tend to get impatient and try to cut corners. 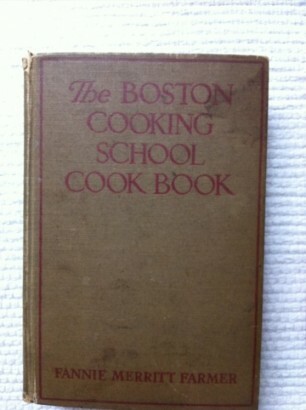 Originally published in 1896 by Little Brown and Company of Boston, Nana’s 1936 edition boasted 1,736,000 copies printed. That is absolutely astonishing given the times, and a testament to the viability of the recipes from which the outcome is usually flawless, unless of course I flub on something. Within the pages are handwritten recipes for dishes like English Mincemeat and French Plum Pudding which Nana used to make. It is a book that I truly treasure and treat with great care. 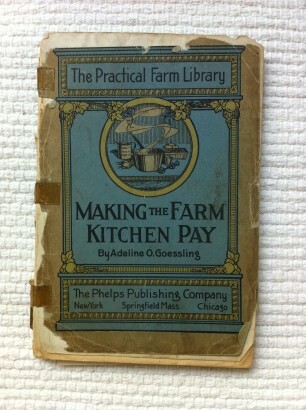 More recently my mother gave me a folder of family papers that included a cookbook , Making the Farm Kitchen Pay by Adeline O. Goessling published in 1914 by The Phelps Publishing Company of Springfield, Massachusetts. If this were reprinted today, it would still sell as it is an essential guide to grow, use, reuse, recycle and make the most of what you have all packed into a mere 89 pages. It is so dog eared that someone, perhaps my maternal great grandmother, wrapped it in a brown paper bag cover just to hold it together. Tucked inside are food splattered notes with recipes for canned meats, marguerites, popovers and yet more mincemeat written in lovely cursive script. When I look at my collection of contemporary cookbooks I wonder which ones will survive the test of time and be passed down to the next generation in my family. I like to think that someday one of my family members will be cooking from one of my favorite cookbooks and have the same sense of connectedness that I now feel with these culinary treasures.